The New York International Children’s Film Festival begins this weekend, and we have a fantastic line up set for this year. The NYICFF has played host to many American anime premieres in the past, including 5cm per Second in 2008 (read my review here) and The Girl Who Leapt Through Time in 2007. NYICFF 2010 opens with the scintillating new feature from emerging anime star Mamoru Hosoda, a film whose “dazzling fluency of motion and untethered brilliance of invention makes the usual fantasy anime look childish and dull.” – The Japan Times. Kenji is a teenage math prodigy recruited by his secret crush Natsuki for the ultimate summer job – passing himself off as Natsuki’s boyfriend for four days during her grandmother’s 90th birthday celebration. But when Kenji solves a 2,056 digit math riddle sent to his cell phone, he unwittingly breaches the security barricade protecting Oz, a globe-spanning virtual world where millions of people and governments interact through their avatars, handling everything from online shopping and traffic control to national defense and nuclear launch codes. Now a malicious AI program called the Love Machine is hijacking Oz accounts, growing exponentially more powerful and sowing chaos and destruction in its wake. This “intriguingly intelligent” cyberpunk/sci-fi story is a visual tour-de-force, with the amazing world of Oz as the highlight. Like the Internet as conceived by pop artist Takashi Murakami, Oz is a hallucinatory pixel parade of cool avatar designs, kung fu jackrabbits, toothy bears, and a bursting rainbow of colors. 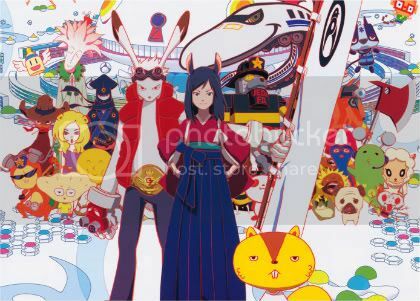 Summer Wars will be showing Friday, February 26 at 6:00 pm (Sold Out) and Saturday, March 13 at 11:00 am (still available). Mr. Hosoda will be in attendance for the Friday showing. This sumptuously animated film about friendship and the passing of childhood is as “splendidly colorful and beautifully illustrated as a Monet landscape” (Hollywood Reporter). Shinko spends her days running barefoot among the endless green wheat fields in her small country village, imagining she is playing 1,000 years ago when the area was the local capital and home to a beautiful young princess kept hidden from society. Shinko gets a new partner for her games when she befriends Kiiko, a shy transfer student from Tokyo whose nice clothes and modern luxuries immediately set her apart from the other kids. Together, the two girls spend their afternoons daydreaming, building dams, chasing animals, and living an otherwise simple and idyllic life – until looming adolescent responsibility and harsh grown-up truths begin to encroach on their make- believe world of princesses and castles, and it becomes increasingly difficult to disentangle fantasy from reality. 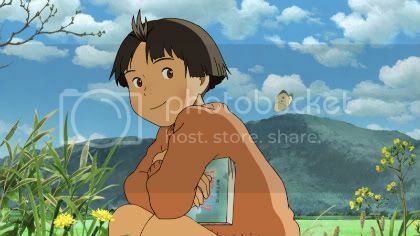 Director Sunao Katabuchi worked with Hayao Miyazaki as assistant director on Kiki’s Delivery Service, and the influences show, from Mai Mai’s stunning animation and exalting focus on nature, to the film’s happy/sad nostalgia for the endless days of summer and the tender portrayal of a young girl at the transition between childhood and adult. Mai Mai Miracle will be screening Saturday February 27 at 5:30 pm and Saturday March 6 at 11:30 am. Unfortunately, both shows are currently sold out. The creators of Ghost in the Shell mix exquisitely detailed 2D backgrounds with modern 3D character designs in a dazzling animated adventure that plays like Alice’s fall through the rabbit hole into a world of topsy-turvy, anime dream-logic. When Haruka misplaces a hand-mirror that was a keepsake from her mother, she stumbles upon a portal to the subterranean world of Oblivion Island, a place where strange masked creatures gather up all the childhood trinkets humans abandon as they grow older, and attend Dream Theaters where they can watch and feel the memories locked in these forgotten objects. The land is ruled by an evil overlord, The Baron, who craves the power created by the memories locked in Haruka’s cherished hand-mirror – a power that will allow him to rise beyond his world of discards and take over the world of humans! Aided by Teo, a lowly junk collector, and Cotton, her old stuffed animal brought back to life, Haruka struggles to recapture the mirror from the Baron, and to rediscover the fleeting moments of childhood love and friendship that are among life’s most precious treasures. Oblivion Island will be showing this Saturday, February 27 at 10:30 am (still available) and Saturday, March 6th at 4:30 pm (sold out). All photos and descriptions provided by the New York International Children’s Film Festival. This entry was posted on Tuesday, February 23rd, 2010 at 10:39 pm by Scott	.